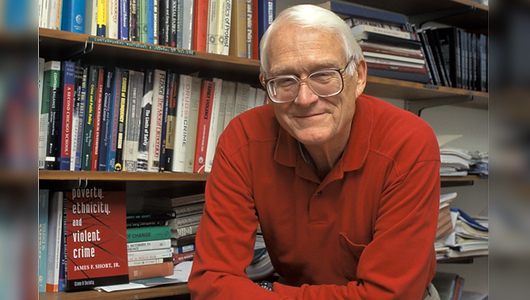 Internationally respected for his expertise and understanding of group dynamics and sociological risk factors, his groundbreaking research into the conditions under which violence, delinquency, and crime occur helped to shape the field of modern sociology and enabled researchers to more fully explore how organizations of all kinds work together. He was among the pioneers in developing robust methodology for the study of delinquent and illegal behavior. James (Jim) Short Jr., early in his career at WSU. In the early 1960s, Jim led a unique study into urban gang behavior in Chicago. Using novel techniques, he and his colleagues worked for three years with numerous gangs and surveyed dozens of gang members, trying to learn whether boys with monikers like Smack Daddy, Duke, and Commando were so very different from their counterparts in wealthier parts of the city. The analysis opened a window into the everyday experience of gang members and resulted in the now classic textbook Group Process and Gang Delinquency. Over the past decade, he had been working with Lori Hughes (’03 PhD), now an associate professor at the University of Colorado Denver, to digitize and analyze the historic qualitative data he and his team gathered in Chicago. 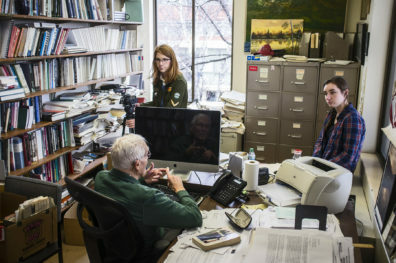 The data has contributed to more than two dozen publications and graduate theses from the 1960s to the 2010s, with more still in the works. Over the course of his six-decade career, he educated generations of sociology researchers and academics, and authored more than 75 papers, 24 books or monographs, and 50 book chapters, as well as nearly 20 encyclopedia entries. Most recently, he provided the introductory chapter of the inaugural Annual Review of Criminology. The editors specifically requested Jim to provide a reflection on his career and influences in studying criminology for the January 2018 publication. In his own words, Jim “was curious about the world around me,” and was well aware of how his small-town childhood and experiences in Japan as a member of the U.S. Marines at the end of World War II helped to shape the course of his life’s work. Following his military service, Jim earned his doctoral degree at the University of Chicago and was promptly hired at WSU as a sociology instructor by then-department chair Wallis Beasley. It was the first time living in the West for the Illinois native and his wife, Kelma, and they fell in love with the Palouse. 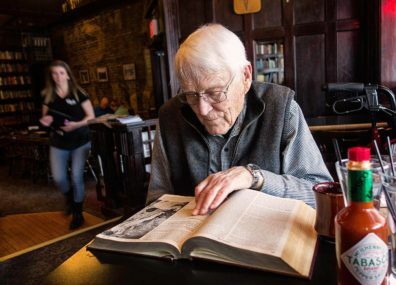 Earlier this year, during one of his regular breakfasts at Rico’s in Pullman with his son Michael, they discovered the 1963 Encyclopedia Britannica World Books among the restaurant’s many bookshelves. Above, Jim reads the entry he wrote on juvenile delinquency for that year’s edition. Photo Copyright ©2018 by J. Michael Short. Jim served as dean of the WSU graduate school from 1964 to 1968, and in 1970 became founding director of the WSU Survey Research Center, the very first telephone survey unit in the country. Now known as the Social and Economic Sciences Research Center, Jim’s colleagues continue to build on his legacy of innovative social science data collection methods and practice. In 1968, he was appointed co-director of research for President Lyndon Johnson’s Commission on the Causes and Prevention of Violence, and nearly four decades later served on the advisory board for the Social Science Research Council’s Task Force on Hurricane Katrina and Rebuilding the Gulf Coast. In between, Jim continued to teach and expand his research, serving as a fellow or visiting professor at universities and organizations across the U.S. and abroad, including Stanford, Cambridge, the University of Chicago, and the Rockefeller Center in Bellagio, Italy. Additionally, from 1970 to 2007, Jim held a series of six different advisory roles on the National Academy of Sciences’ National Research Council. Throughout his eminent career, Jim earned numerous professional awards and accolades in sociology and criminology. He was a fellow of the American Association for the Advancement of Science and a past president of both the American Sociological Association and the American Society of Criminology. He also served in various editorial capacities for 20 different journals across the disciplines of law, political science, criminology, sociology, and justice. In 2000, the American Sociological Association established the “James F. Short Jr. Best Article Award” in the Crime, Law, and Deviance Section to honor him and his work. 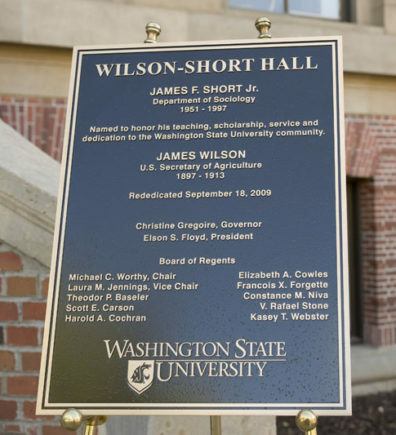 The rededication plaque for Wilson-Short Hall (photo by WSU Photo Services, 2009). • Distinguished Faculty Achievement Award in the College of Sciences and Arts, 1988. The family requests memorial gifts be directed to the James Short Professorship fund or the Jordan Schnitzer Museum of Art WSU. Cards may be sent to the WSU Department of Sociology and will be forwarded to the family (PO Box 644020; Pullman, WA 99164). 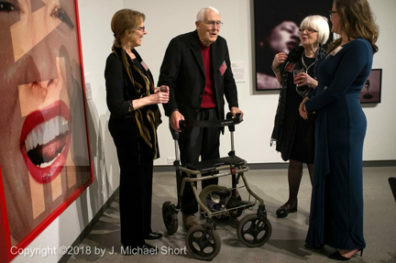 Jim, center, at the Jordan Schnitzer Museum of Art WSU gala in March 2018. Photo Copyright ©2018 by J. Michael Short. Kimball Funeral Home in Pullman has been entrusted with arrangements. Plans for memorial services are undecided at present. Top photo: James (Jim) Short in his office at Washington State University in 2009 (photo by WSU Photo Services). By Joanna Steward, College of Arts and Sciences, with thanks to previously published articles by WSU News, Washington State Magazine, KREM/Murrow News Service, and the WSU Department of Sociology.